Why am I writing this paper now? Over my 28 years as an Independent Financial Adviser (IFA) I have had the pleasure and good fortune to work with many decent people. People who have sacrificed, saved, planned and been careful with their money. Those people, and many more, who are in final salary pensions, also known as defined benefit pensions (DB Schemes), have been told that this is the best type of pension you could have. It is often referred to as a “Gold Plated” pension and that the pension was guaranteed. I am writing this paper now because the shine has come off these gold plated pensions and there are systemic problems with them that we expect to lead to much lower pensions for members of these schemes. You should read this report as it is highly educational in examining systematic problems in defined benefit pensions which will cause reduced pension benefits to people in these schemes. It includes a real case study and has up to date detail. We examine how these schemes could be rescued and show why the only reasonable option is to expect member benefits to fall, no matter what they have been promised in the past. Importantly, the report also discusses how, currently, you can secure your accrued fund before any of these expected changes happen. DB Schemes became very popular in the 1960s. During this period more people tended to stay longer with their employer than they do now and some stayed with that employer all their working life. Government agencies such as the military, teachers and civil servants also had DB schemes. Indeed, an often quoted phrase was that you could afford to work in some of these Governmental jobs where the pay was lower than the private sector because the pension was so very good and would make up for it. There was some truth in this comment. A critical component of these schemes was, and still is, that the sponsoring employer would always ensure that there was sufficient money in the pot to meet the liability to pay the pension. Some schemes did not ask members to pay anything, others a small amount to reduce the cost of funding the scheme for the employer. When these pensions started the average life expectancy in retirement was around 12 years. Scheme actuaries calculated how much was needed to pay pensions for this length of time. 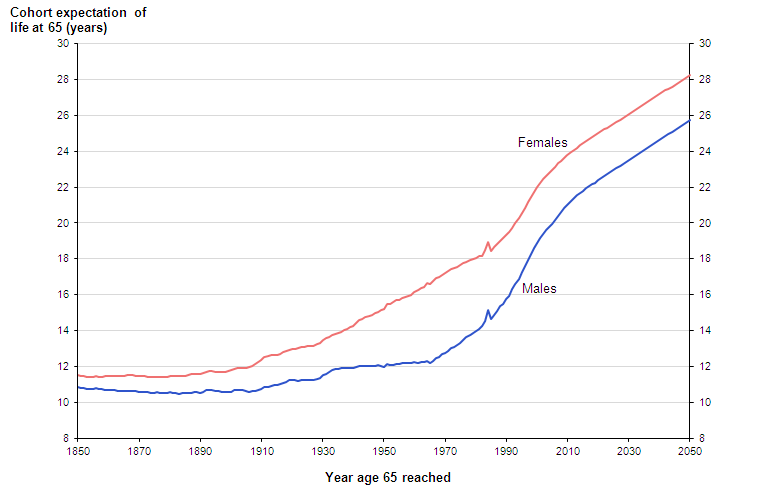 In the 1970’s this changed rapidly with increased life expectancy. This change is forecast to continue as shown by the statistics from the Office of National Statistics shown below.